IndustrySafe is a safety management system for businesses and organizations of all sizes and industries. It offers a comprehensive, cost-effective, web-based safety management software, so that organizations can track, manage, and comply with environmental, health, and safety regulations. It provides a very user friendly and cost effective environmental, health, and safety software for our clients. IndustrySafe’s software enables clients, leaders in construction, manufacturing, government, energy, and transportation to track incidents, inspections, osha reporting, observations, and other matters. In particular, it provides incident and injury management (including OSHA reporting), safety inspection checklists, safety recommendation tracking, training management tracking, hazard management, and behavioral based safety tracking to help organizations improve safety throughout the organization. IndustrySafe safety management software includes several modules designed to help safety coordinators monitor their business in a variety of areas, including incident management. By collecting and analyzing relevant data on incidents in the workplace, organizations can better monitor their efforts to comply with safety regulations and ensure worker health as prescribed by the Occupational Safety and Health Association (OSHA). 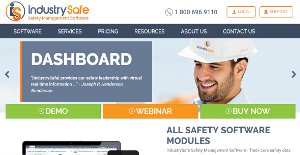 IndustrySafe’s dashboard enables its users to create and view key safety performance metrics. They can drill down on these metrics and configure the Dashboard to display their top indicators. The dashboard is updated in real-time as data is entered into other modules as well, providing convenience and avoiding data redundancy as well. It is also customizable in such a way that users can configure values, edit panel titles, or select the metrics shown on the tabs. With IndustrySafe’s Claims module, organizations can create various types of claims including worker’s compensation, property damage, and auto claims that can be linked to one incident report. Payment information and claims notes can be tracked. Organizations can create various types of claims including worker’s compensation, property damage, and auto claims. Its Observations Module enables organizations to focus on behavioral based safety techniques and allows users to conduct observations on employees involved in safety critical behavior. If you are considering IndustrySafe it might also be a good idea to analyze other subcategories of Best EHS Software gathered in our base of SaaS software reviews. Each business has its own characteristics, and might call for a particular type of EHS Software solution that will be designed for their company size, type of clients and staff and even specific industry they support. We advise you don't count on finding an ideal services that will be suitable for each business no matter what their history is. It may be a good idea to read a few IndustrySafe reviews first and even then you should remember what the solution is supposed to do for your business and your workers. Do you need an easy and intuitive solution with just essential features? Will you really make use of the complex functionalities needed by pros and big enterprises? Are there any particular features that are especially useful for the industry you work in? If you ask yourself these questions it is going to be much easier to get a solid service that will fit your budget. How Much Does IndustrySafe Cost? We realize that when you make a decision to buy EHS Software it’s important not only to see how experts evaluate it in their reviews, but also to find out if the real people and companies that buy it are actually satisfied with the product. That’s why we’ve created our behavior-based Customer Satisfaction Algorithm™ that gathers customer reviews, comments and IndustrySafe reviews across a wide range of social media sites. The data is then presented in an easy to digest form showing how many people had positive and negative experience with IndustrySafe. With that information at hand you should be equipped to make an informed buying decision that you won’t regret. What are IndustrySafe pricing details? What integrations are available for IndustrySafe? If you need more information about IndustrySafe or you simply have a question let us know what you need and we’ll forward your request directly to the vendor.